If you’re just here for the deets on Wednesday’s event, click here for tickets and don’t forget to use my code “MONICA” for 20% off. Back when I had my marketing agency, I specialized in working with brands looking to enhance their relationship with women and, more specifically, mothers. At that time, around 2008, I wasn’t a mom yet, but I began building my mama network with projects such as the first Mom 2.0 summit (that we planned right here in Houston), and micro-community businesses like Bright Sky Press and New Living (and formerly the Green Painter). It was a special time when social media was connecting businesses and consumers, and the wild wild west of digital ambassadorship was born. I was excited to be helping Houston’s healthy home store, New Living, make connections with local neighborhood leaders and parents, and was introduced to Misti Pace-Krahl, who was new to town at the time–which you would have never known by her outgoing personality and already growing network. At the time, Misti’s fashion and styling business had just began a mom-focused “edu-tainment” event, The Mommie Series, and was looking for venues to hold upcoming events. We were introduced by fellow entrepreneur and healthy living advocate, Lisa Pounds of Green Plate Foods, who had just begun selling her homemade crave-worthy health-focused food for kids and families at New Living. 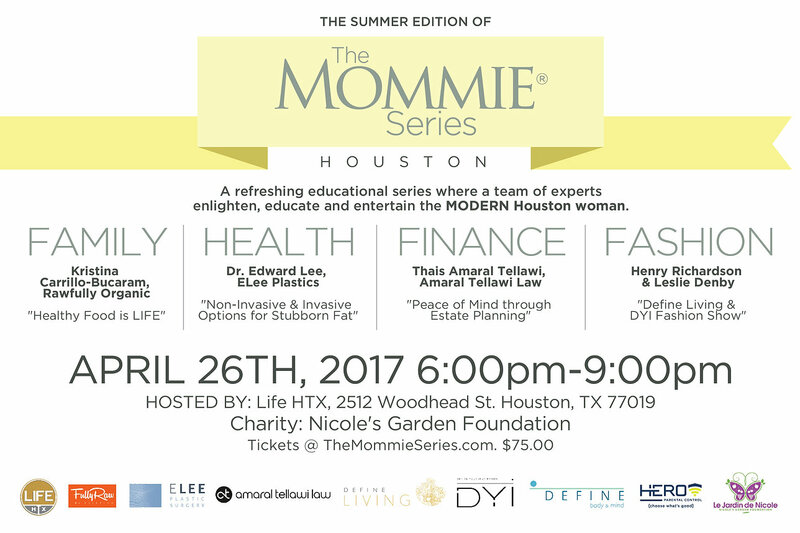 We met and instantly hit it off and we began to plan one of the very first Mommie Series events at New Living. Over the last 8 years, Misti has grown the Mommie Series into one of the best resources for moms to connect with other women for a seasonal event that curates a Family, Health, Fashion, snf Finance speaker at each event. She’s since also added a “Mini-Series”, a more intimate version of the popular event focused on one subject. I was thrilled this year when Misti reached out to me to ask if I would be a 2017 Mombassador for The Mommie Series. Still getting used to my new role of “mom” and how that contributes to my identity, I was excited to explore my role in this group and to meet other women looking to enhance connections. I’ve since enjoyed getting to know the other Mombassadors, an amazing group of diverse women. Our first event, the Spring Edition, held annually at Houston’s fashion mecca, Tootsies, was a great success. It was my first Mommie Series event since I had become a mom and it felt great to find a community of working and stay at home moms all looking to enhance their lives and the lives of their families. That first event I met Dr. Alana Kennedy-Nasser of Pure Pediatrics, a concierge model of pediatrics focused on practical health and wellness. Her talk really connected with me and my philosophy on autoimmune health and wellness, and helped me explore my thoughts on how to take my beliefs and extend them to my child and family’s nutrition. That event was followed by a Mini-Series at Dr. Alana’s office which also was a great resource for ideas on nutrition for kids. Lots of thoughts on this for a future post! This week the Summer Edition will be held at Life HTX, the luxury event venue and brainchild of fitness guru Henry Richardson, founder of Houston’s Define body + mind studios. Looking forward to kicking of the summer season with great speakers including Rawfully Organic‘s Kristina Carillo-Bucaram and Henry and his sister Leslie Denby showcasing their fitness clothing line. Full details below. I’ve got a discount code for you to use for the event. Use “MONICA” (before selecting the quantity, look in the upper right corner) for 20% off. Look forward to seeing some of you at this awesome event. I’ll post more on future events and the 2017 series as they are announced.